IONI drives virtually any type of industrial servo motor including AC, Brushless DC, Brush DC, Linear servo motors and stepping motors from 5 Watt to 700 Watts. Whether the application requires position, velocity or torque operating mode, IONI handles them all out-of-the-box. Built-in motion profiler enables simple point-to-point moves as well as continuous synchronous motion tracking. Chain IONICUBE motherboards to form 1 to 32 axis systems. Install them centralized or distributed to near motors. IONI reduces the number of motion control components to the bare minimum. A typical PC controlled multi-axis system can be implemented by using direct USB or RS485 driven SimpleMotion field bus to the servo drives. The same bus carries a dedicated safety stopping circuit without additional wiring. The wiring scheme is compatible with ARGON drive allowing mixing different kinds of drives. In addition to SimpleMotion bus, IONI also reads traditional control signals, such as pulse & direction, PWM, and analog velocity reference out of the box. In such case, SimpleMotion is only used for drive configuration with Granity. 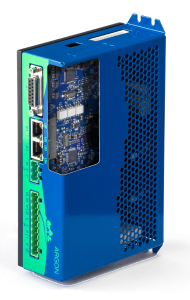 IONI servo drive was made possible by building on the latest and greatest components available today. This do not only save space, but also drastically reduce number of parts to be paid and fail. 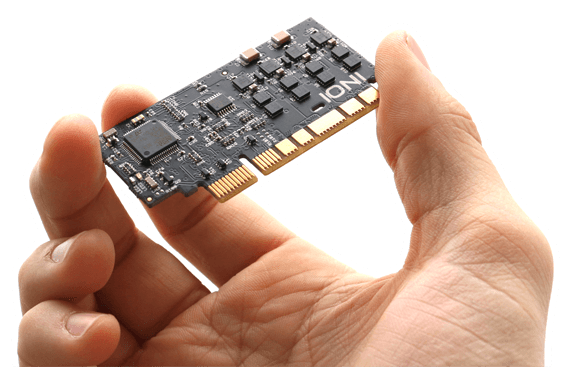 IONI is solely made out of the highest grade components from the most reputable hi-tech companies such as Texas Instruments, ST Microelectronics and Infineon. 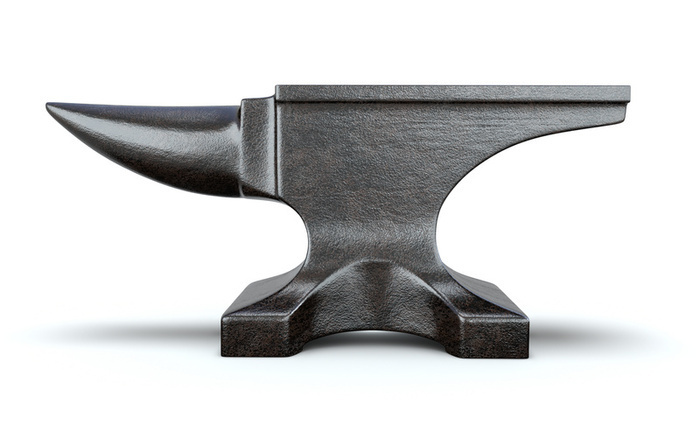 Hardware of IONI has been designed from ground up without any historical payload. This not only costs less but also yields unforeseen flexibility and reliability. Servo/stepping motor drive Closed loop control of various types of servo motors by sinusoidal field oriented control with dead-time distortion correction and high dynamic range torque control. Additionally an external 5 VDC logic supply required. Note: if drive is used with IONICUBE motherboards, then 24 VDC logic supply voltage is needed instead as IONICUBE has on-board 5V regulator. Compliance CE (LVD & EMC): EN 61800-5-1:2007, IEC 61000-6-1:2005 and IEC 61000-6-3:2006. In order to meet EMC standard requirements, a proper installation and wiring is necessary. Refer to user guide for proper installation. 1) Currents achievable continuously only with with sufficient coolant air flow. 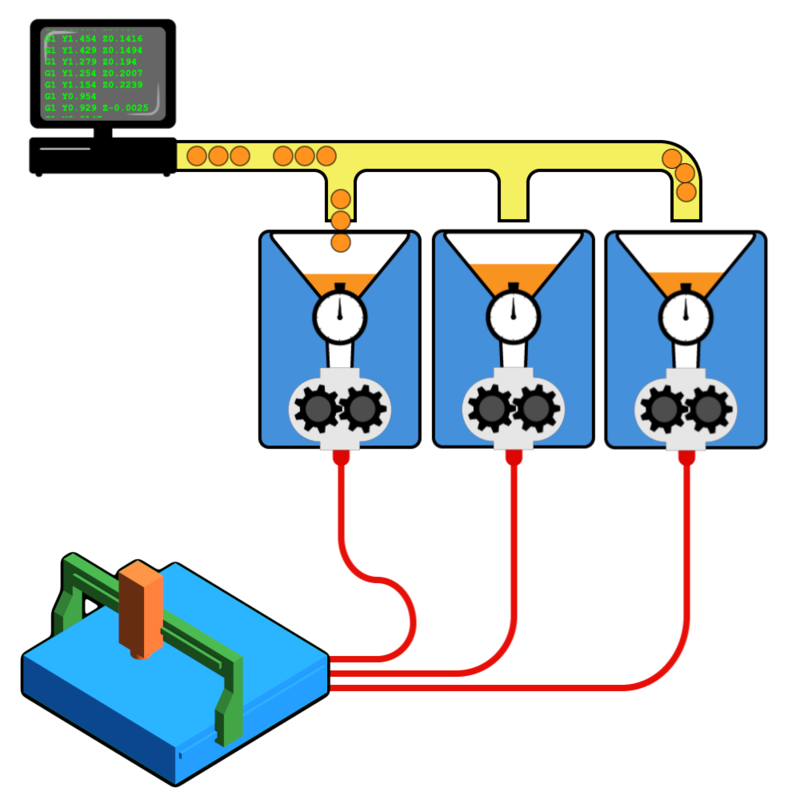 Without forced cooling, typically 30-45% of the maximum range can be driven continuously. Despite of this, maximum current is available for short periods of time even without cooling. Current is automatically throttled on temperature rise to protect the drive. Goodbye frustration, hello future! Granity makes setup and tuning of servo motor a breeze. Combined with walk-through online documentation, motors are fully configured and running in the record time. No worries. We give you plenty of time to use the servo & stepper drive products before you decide whether to keep it or not. Granite Devices accepts product returns within three week period from delivery and pays the full amount back - no questions asked! 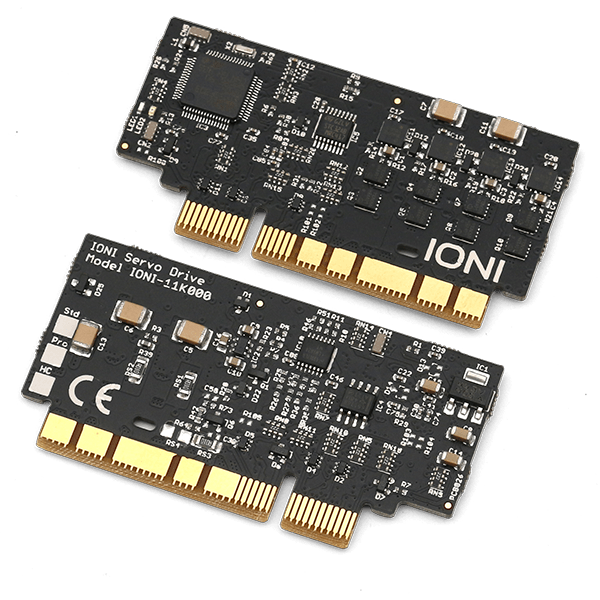 IONI has been constructed from the components of the most reputable suppliers like Texas Instruments, STMicroelectronics and Murata to guarantee the maximum service life. Also integrated surge protectors exceeding the requirements of IEC 61000-4-2 ESD standard will prevent damage induced by the outer world. 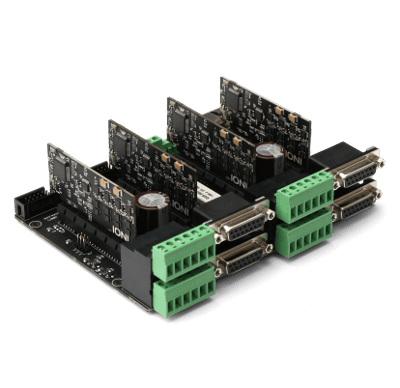 EtherFOX is an 10 axis EtherCAT® bridge to Granite Devices drives. 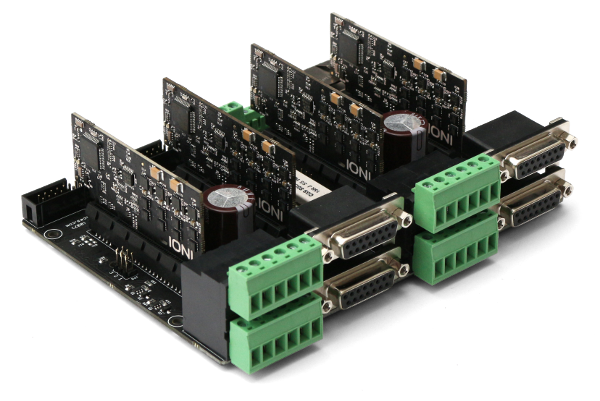 Build real-time EtherCAT based motion control systems by combining EtherFOX with IONI or ARGON drives.